Qualification, Experience and Pay Scale are as per the norms of Govt. 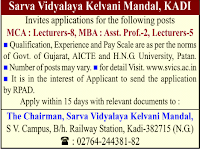 Of Gujarat, AICTE and H. N. G. University, Patan. Number of posts may vary. It is in interest of applicant to send his/her application by “RPAD”.